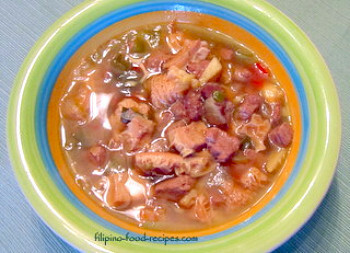 Papaitan is that popular Ilocano bitter and spicy stew consisting of beef or goat innards as liver, heart, tripe and the bitter bile (apdo). 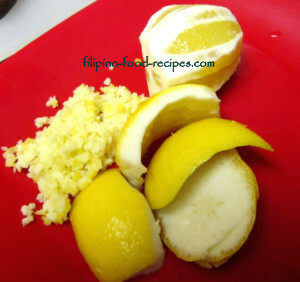 However, this is a modified pinapaitan recipe -- meaning, instead of using bile to get the signature bitter taste, lemon peel and pith(white part of the lemon peel) is substituted. It is much like using the Pinapaitan ready mix -- try reading the ingredients at the back of the packet and you will find lemon peel as one of the ingredients. --or you simply have no appetite to eat a dish with the dreaded bile, the lemon pith alternative is your best option. The tripe is boiled separate from the rest since it has the longest cooking time. See Cooking Tripe page for tips. Similarly, we cook the cow innards separate from the beef because we usually discard the liquid from boiling the innards. You will also notice that this recipe uses a whole lot of lemon. Only half of the lemons will be used for their peels and pith and the other half reserved just in case the broth is not bitter enough. The juice of all the lemons are added in the end for a fresher citrus taste. 1 Prepare the lemons by peeling 4 out of the 8, then grinding or chopping the peel and pith finely. Juice all 8 lemons and set aside. 2 Boil the peel in 2-3 cups of the beef broth, then strain and set aside. 3 Saute the garlic, onion, ginger, and chili pepper, then add the beef and innards and saute for about 3 minutes. 4 Together with the bitter beef broth, add the rest of the ingredients except for the lemon juice and bring to a boil. 5 Simmer for 10 - 15 minutes, then add the lemon juice. 6 Serve hot with rice or an icy cold beer. Calamansi cannot be used as substitute to get the bitter taste because there isn't really any bitter pith from them. The kind of offal or innards you want to add to your Papaitan is totally up to you -- or you could use just tripe with the cubed beef. 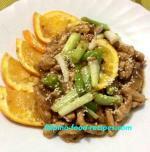 You could do away with the other lamang-loob or beef offal. If you want to add liver, try pork liver rather than beef as they are more tender. Put the cubed pieces at the last minute and cook briefly so they don't get tough and chewy.